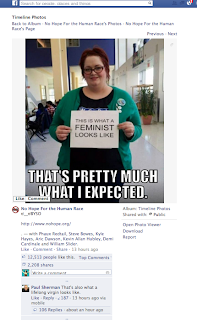 In My picture was stolen and turned into a fat-shaming anti-feminist meme on Facebook, Kelly Martin Broderick describes the kind of social media-fueled crisis that no communicator can guard against: Her photo, part of a "This is what a feminist looks like" campaign, was hijacked, turned into a meme, and shared and liked thousands of times of Facebook and Tumblr. Broderick--a university student, not an organization unto herself-- nonetheless handled the crisis like a pro. She confirmed a report she'd had from a friend about the meme to see it for herself and saved screen grabs of the offensive comments. She got in touch with Facebook to ask for the meme's removal (a process aided by having screen grabs, by the way). 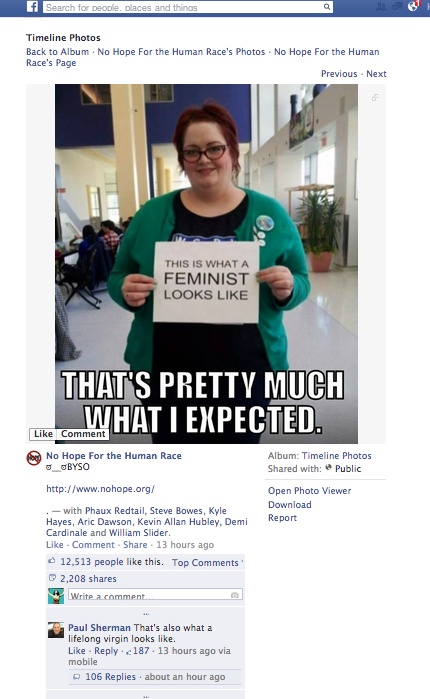 When Facebook refused to remove the meme, she published a response--one that disclosed her complaint to Facebook and its response to her, while thanking her friends for their support. Rather than get angry online in turn, she opted for a positive message while calling out the meme-maker and Facebook. Broderick put the same social tools to use that had been used to hurt her. One response used Facebook to directly share the offensive post, which not only puts the offender and anyone else who has commented on notice, but offers direct proof of the bad behavior. During this time, she also learned the meme had been shared on Tumblr, so she created her own Tumblr on This is What a Feminist Looks Like, and encouraged friends to post there. And she started sharing her story, as in the article linked above from XOJane. Some smart crisis communications group should hire her, pronto. Turns out that method can work for your organization, too. A University of Missouri study shows that organizations can help their public image by turning to Facebook to correct the record and respond to damaging coverage. Narrative posts worked better at improving organizational image on Facebook during a crisis, the study notes, so don't limit your post to the official talking points on your crisis. It's the very personal approach Broderick took in disclosing the crisis that makes her response effective and shareable. Unfortunately, the study authors didn't share the posts used in their research, but PRNewser has already put out a call for them.